Published on June 20, 2014 in General T&T, Media, Opposition Party, People's Partnership, PNM and UNC. 4 Comments Tags: Express, Parliament, Politics, T&T Govt. A financial boost for judges and Parliamentarians is on the way. The holder of the third highest office in the land—the Chief Justice—will now receive the highest pension- $93,223 a month tax free. This, according to the new pension arrangements passed by the House of Representatives on Friday night at the International Waterfront Centre, Port of Spain. Two bills—the Retiring Allowances (Legislative Service) Bill and the Judges Salaries and Pensions (Amendment) Bill—passed at around 10.30 p.m.—have made judges and Members of Parliament and the Senate the beneficiaries of major improvements in their retirement benefits.. The Judges Bill allows the allowances of judges to be added their salary to become their new pensionable emoluments. Under the arrangement the Chief Justice pension moves from $50,350 tax-free to $93,223. This benefit will apply the incumbent at retirement and would apply immediately to his predecessors and successors. If the law is passed, the pension of retired chief justices would immediately become equal to the salary and allowances of a sitting Chief Justice. The same principle would apply to judges. With respect to members of Parliament. the bill similarly introduces sweeping changes that applies to any member of the House who served after 1976 and any member of the Senate who served after 1996. This new system of retirement benefits applies to parliamentarians. The biggest beneficiaries would be parliamentarians who at any time during that period (post 1976 or post 1996 (in the case of senators) served as a minister. That is because their pension from now on would be calculated, using the rate of the salary and housing and transport allowances of an existing minister. This applies also when those salaries and allowances increase in the future. For those MPs and senators who at any time were ministers and served in the legislature for 18 years or more, their monthly pension would be —$60,050 month—equal to the monthly salary and allowances of a minister and would increase whenever those figures increase. Under the current system, which the legislation proposes to replaced, a minister who served 18 years or more would have received a pension of $27,353.33. Current MPs who qualify on the People’s Partnership side are Chandresh Sharma, Winston Dookeran and Speaker Wade Mark. On the Opposition side the beneficiaries are Opposition Leader Dr Keith Rowley and Port of Spain North East MP Colm Imbert. Former ministers who qualify for this amount include Errol Mahabir, Kamalludin Mohammed and Pamela Nicholson. These people served 18 years or more—the period required to qualify for the maximum pension payment under the revised terms and conditions. Interestingly under the proposed system those members of Parliament over 55 years old who qualify for the maximum pension benefit (of $60,050) would immediately receive this sum, which is equivalent to the minster’s pensionable emolument, no matter where they sit. 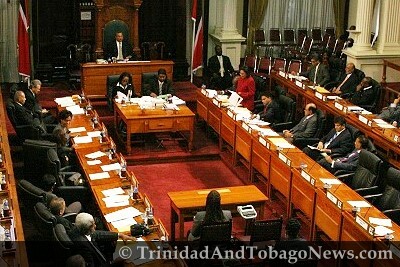 In short, Sharma, Rowley, Imbert and Mark (whose Speaker’s salary is less than a minister’s) would receive $60,050 immediately, upon the passage of the bill. Dookeran’s ministerial package is already at that level. Kamla Persad-Bissessar, Patrick Manning and Basdeo Panday who all served for 18 years or more are not included in this arrangement since their retirement benefits are governed under the Prime Ministerial pension arrangement. In order to qualify for any parliamentary pension a minister or backbencher or senator must serve a minimum period of four years in Parliament. Such a person would receive one-third of the salary and allowances of the current holder, as pension. Currently this sum would be $20,515, up from $6,838.33. As it stands MPs such as Dr Glenn Ramadharsingh and Collin Partap would be eligible to receive $20,515 immediately, provided that they are 55 years old. If younger, they would have to wait until they are 55 years. In the same category would be senators like Kevin Ramnarine, Devant Maharaj, Emmanuel George as well as former ministers who served in the NAR Government, the UNC Government and PNM Governments but were only in Parliament for one term would also receive a pension of $20,515. Members of Parliament are also entitled to a gratuity equal to 20 per cent of total salary paid to them over the parliamentary term. This is paid by the Ministry of Finance upon the dissolution of Parliament. In addition to this, the new bill proposes a termination benefit, which Government leader Dr Roodal Moonilal, said it designed to help former MPs make the transition back to private life. To qualify for this benefit a member of Parliament must cease to be a member of the House by virtue of him/her having lost his/her seat in the election. Wow…a pension is suppose to be enough for a comfortable lifestyle but this type of expense is scary. WE all know why the opposition and others are not objecting to this bill. After all, they are quite concerned about the welfare of the country and its citizens — YEH RIGHT!!! Former head of the public service Reginald Dumas and former Independent Senator Martin Daly are calling on the Government to limit proposed salary and pension increases to judges and MPs to an interim period, pending determination of the matter by the Salaries Review Commission, which is the constitutional body responsible for salary and other increases. Their call was made in a letter to all senators yesterday, on the eve of today’s scheduled debate on the Retiring Allowances (Legislative Service) (Amendment) and the Judges Salaries and Pensions (Amendment) bills in the Upper House. The bills, which seek to approve significant increases for judges and MPs, were passed with the support of the Opposition in the House of Representatives on June 13. The move by the two was unlikely to have any effect on the outcome of today’s debate. The bills will not be put to the vote as they are money bills which cannot be vetoed by the Senate. Former Attorney General Ramesh Lawrence Maharaj also opposed the move yesterday. There have been public objections to the measure in the media. The Retiring Allowances (Legislative Service) (Amendment) Bill and the Judges Salaries and Pensions (Amendment) Bill recently passed by the House of Representatives have, unsurprisingly and rightly, set off a firestorm of public protest. Among others, issues of fairness and equity, of constitutionality — for example the separation of powers, the functions and performance of the Salaries Review Commission (SRC) and the disproportionate nature of the measures — have been raised. If these two pieces of legislation are carried forward, they may in the future have to be settled in the courts of law as well as in those of public opinion. We do not oppose the principle of enhanced benefits for judges and parliamentarians. We emphasise however that there are other retired persons such as magistrates and public servants who, for many years, and in several cases for decades, have served this country conscientiously and well, and who deserve pensions higher than the ones they receive at present. For instance, there is at least one retired permanent secretary who is now a centenarian and whose pension is less than that of the deceased judge mentioned in the debate on these bills. Is his age to be held against him? There are also retirees, former parliamentarians among them, whose need for costly medical care is constant. We feel that the approach hastily taken by the House is likely to lead to more problems for T&T as a whole than it solves for a chosen few. We should all wonder about the precedent being set. What possible impact on our institutions, our economy and our democracy might there be as a result of this decision by persons whom we elected to serve us and who are now seen as serving themselves at our expense, and, moreover, to be doing so to the exclusion of persons similarly circumstanced? Equitable salary and pension reform for the judiciary and for certain public office holders cannot sensibly be done in the piecemeal, discriminatory and hasty way adopted by the House of Representatives. Given the constitutional position of the Salaries Review Commission, we strongly urge that the legislature should limit its intervention to the extent of interim provisions designed to take care of the urgent needs of the directly affected persons — former judges, magistrates, parliamentarians, public officers, etc and their surviving spouses or co-habitants — on clearly defined bases, such as length of service, the effect of cost of living over a defined period and compassionate need arising out of illness. We are copying this letter to all members of the Senate. Members of the business sector are calling on all arms of the legislature to consider carefully their decision while debating the Judges Salaries and Pensions Amendment Bill and the Retiring Allowances (Legislative Service) Bill today. The call was made yesterday by the American Chamber of Commerce, T&T Coalition of Service Industries, Chamber of Industry and Commerce (TTCIC) and the Manufacturers’ Association. In a press release issued as the Joint Chambers Group, questions were raised as to whether there had been enough consultation on the matter before the decision was made. “In light of our slow economic growth and given the fact that the Minister of Finance had signalled his intention in 2013 to reduce our fiscal deficit, with the components making up this deficit, including recurrent expenditure, such as salaries, wages and pensions, is it wise to assent to all of these increases at this time?” the group asked. “We understand that retroactive payments will also apply and this is of great concern to this group. We question whether these costs have been comprehensively calculated to determine the true cost to the Treasury, and, if so, we call for full public disclosure of these costs,” it added. The Joint Chamber Group noted that due to its members’ concerns and those raised by others in society, the Government should allow the bills to lapse to allow for further clarification, ventilation and consideration of the issues involved and impact of their passage. “Since the Parliament is due to go on recess shortly and these bills enjoy cross-partisan political support, we consider this to be the most prudent course of action, as it will not affect their eventual passage in the next session of Parliament if that is still the desire of the Legislature,” the joint group said. When public opinion reaches the highest point of indignation against this travesty, Rowley and the PNM will find a convenient excuse ( remember section 34) to wiggle out of this Bill which they eagerly supported. They might even join Labour in a massive march in Port of Spain, expressing their hypocritical opposition to the Bill. Total disappointment with these parliamentarians! What were they thinking?